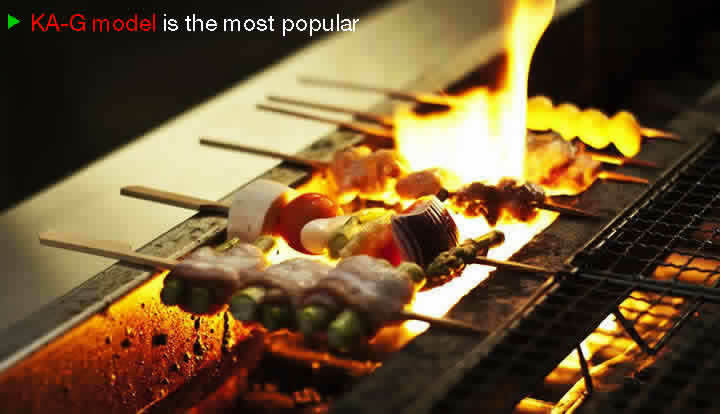 Smoky "Flavor" is the most important value on Grilled Food!! It's our original "charcoal made by ceramic"
which radiate high quality far infrared rays. Easy Handling, Energy Saving and Keeping High Quality by using our Griller applying far infrared rays! We, Kosei Kogyo, make it easy? 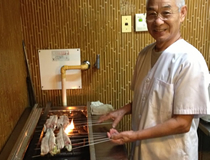 to grill foods by "Kosei charcoal Griller"!! ◆Taste of great chef of natural charcoal!! ◆Usable together Natural charcoal for its scent? Smoky flavor is available by adding a few pieces of natural charcoal on the grill. Reliable Griller which grill all kinds of foods & pursuit?great taste We created "Ceramic Charcoal" which was first in Japan in 1983. Our "unique" griller which brought the taste almost same as the taste by natural charcoal grill, was sensation. We, Kosei Kogyo, have been satisfying professional chefs by continuing research, original technology, product of excellent quality, and non-stop advancement. Originality of "Kosei charcoal Griller"
Our "Kosei-charcoal" radiating far infrared rays made by ceramic Can grill foods with strong heat penetrating power.